Usain Bolt broke his own world record in the 200 meters as he completed the sprint double in the world championships in Berlin in sensational style. The remarkable Jamaican took gold in 19.19 seconds, shaving just over a tenth of a second off the mark he set in winning the 200m at last year’s Beijing Olympics. Bolt also smashed his own 100m world record with a 9.58 seconds clocking in claiming gold in the shorter sprint on the second day of the championships. Bolt, who celebrates his 23rd birthday on Friday, made a fine start and was well clear of the field coming around the bend, clearly pushing to the line as he eyed his old mark of 19.30 seconds. Alonso Edward of Panama claimed a fine silver in 19.81 seconds with Wallace Spearmon of the United States taking the bronze in 19.85 seconds. 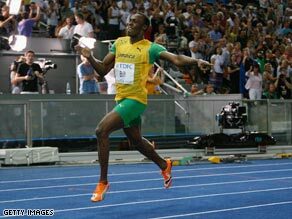 Bolt will bid to emulate his triple gold medal tally from Beijing in the sprint relay for Jamaica in the final day of the championships on Sunday. Earlier, Jamaica’s gold rush in Berlin continued with victory for Melaine Walker in the women’s 400m hurdles. Olympic champion Walker ran the second fastest time in history of 52.42 seconds to relegate Lashinda Demus of the United States to the silver medal position while Trinidad and Tobago’s Josanne Lucas took bronze. Bolt’s victory later on Thursday was Jamaica’s fifth gold at the global championships. He had looked fatigued in the qualifying heats of the 200 and admitted after his victory that the record was unexpected after missing nearly a month of training following a car crash in Jamaica earlier this year. “I can definitely say I didn’t expect that because I was a little bit tired,” he told the BBC. “Maybe next time I should just run the 200m or the 100m alone. My form was going backwards. I wasn’t running upright. It wasn’t a good race but it was a fast one.” Bolt has been the undoubted star attraction of the championships, but other fine performances included an easy qualification for the 5000m final by Ethiopian Kenenise Bekele. He won his heat as he bids to complete the 5000-10,000 double. Ryan Braithwaite gave Barbados their first ever medal at the world championships as he took the 110 meters hurdles title while Croatia’s Blanka Vlasic succcessfully defended the women’s high jump title. The 25-year-old jumped 2.04m to beat Anna Chicherova of Russia and home favorite Ariane Friedrich who took the minor medals with 2.02m clearances. The sixth day of competition in the German capital began against the backdrop of a gender row centering on South African Caster Semenya. She claimed gold in the women’s 800m but before Wedneday’s final the IAAF revealed that they were undertaking a gender verification test on the teenager. Officials and family rallied to her defense and the 18-year-old received a warm reception as she received her gold medal in Thursday’s ceremony.